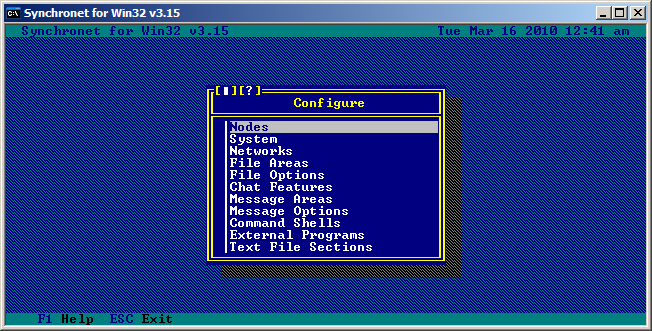 The Synchronet Configuration Utility (SCFG) is used for viewing and modifying the various CNF files in the Synchronet ctrl directory. Note: some of the interface mode values are only available on particular platforms/operating systems. If the SBBSCTRL environment variable is set, then SCFG will find the CNF files without needing you to specify the path to the ctrl directory ([ctrl_dir]) on the command-line. If the SBBSCTRL environment variable is not set and the [ctrl_dir] is not specified on the command-line, SCFG will look for the CNF files in the current working directory.